The present study deals with the bioactivity assessment of 5,11,17,28-tetrakismorpholinomethyl25,26,27,28-tetrahydroxycalixarene (3) against a variety of microorganisms including Gram Positive; Staphylococcus albus ATCC 10231, Streptococcus viridans ATCC 12392, Gram Negative: Bacillus procynous ATCC 51189, Enterobacter aerogenes ATCC 13048, Klebsiella aerogenous ATCC 10031, Escherichia coli ATCC 8739, Sallmonella ATCC 6017 and Fungi: Aspergillus Niger ATCC 16404, Aspergillus fumagatus ATCC 90906, Penicillium ATCC 32333. The antimicrobial activity was found by using a modified disc diffusion method. All microorganisms were obtained from the American Type Culture Collection (ATCC) and selective agar media were employed for the growth of microbial strains. Results show that all the tested microorganisms are highly susceptible to compound 3. The MIC of 4 μg/μL and 8 μg/μL was determined against most of the bacterial and fungal strains. The bioactivity of 3 could be a valuable addition in therapeutic index. SOOMRO, Ali Muhammad et al. Bioactivity Assessment of Water Soluble Calixarene Derivative. 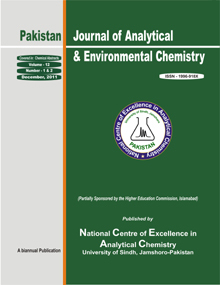 Pakistan Journal of Analytical & Environmental Chemistry, [S.l. ], v. 13, n. 1, p. 4, june 2012. ISSN 2221-5255. Available at: <http://pjaec.pk/index.php/pjaec/article/view/179>. Date accessed: 21 apr. 2019.